(MP182). Commander Eric Tufnell RN (1888-1979). Watercolour signed but not dated..
Standard size: 16 x 11.5 ins (40.5 x 29 cms) approx. Built under the Emergency War Programme by Palmer’s on the River Tyne September 1916-December 1918 as one of 8 ships of the Danae class, these ships were a development of the earlier Cardiff Class. They had a length overall of 472 ft, displaced some 4, 850 tons and when completed were armed with six 6inch (152mm) and three 4inch (101mm) guns as well as many smaller calibre weapons and 12 torpedo tubes. They were capable of some 30 knots and were regarded as widely employable in a variety of roles when they first started joining the fleet in the closing months of the Great War. Two of the class, DAUNTLESS and DRAGON, had initially been completed with an aeroplane hangar in the usual lower bridge structure forrard. DAUNTLESS first went to the Baltic for post WW1 operations there and then to the West Indies Station for several months in 1919 but later that year she returned to the Atlantic Fleet where she joined the 1st Cruiser Squadron in which she served until 1925. During this time she was part of the Special Service Squadron, led by HMS HOOD, that undertook the Empire Cruise of 1923-24. She briefly served again in home waters before being despatched to join the Mediterranean Fleet in 1925 for a 2 year commission. The China Station followed and then in 1928 she was to be found back on the North America and West Indies Station where she ran aground heavily off Halifax, Nova Scotia being hauled off eventually by HMS DESPATCH. She returned to UK for extensive repairs and on completion was placed in the Reserve Fleet for a year before being recommissioned for service again on the North America and West Indies Station which is where this is painted. 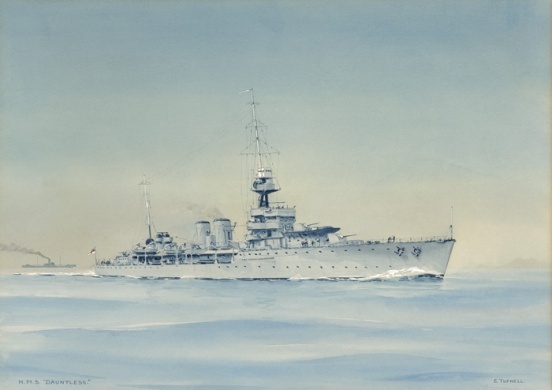 The original owner of this watercolour, Captain (E) C Gatey RN was her Senior Engineer for this commission and the painting has since been handed down through the family. DAUNTLESS went into Reserve again in 1935 but re-entered service in 1939 and spent a very busy war in areas as far apart as the South Atlantic, China Sea and Indian Ocean with the Eastern Fleet. She returned to UK in 1944 to pay off finally and met her end at Thomas Wards, the shipbreakers at Inverkeithing, Scotland, in 1946. The copyright of this painting has yet to be obtained from Mrs Greenup (widow of the late Eric Tufnell); once permission has been granted it is planned to produce a limited edition of 49 copies.